If you live on the East Coast like me, Fall just sort of barged its way in this weekend! Saturday was super rainy. Yesterday was nice, with temperatures in the high 60s. I was telling Mr. Sparkle that it's amazing how quickly I can forget just how chilly that feels! Despite the fact that I didn't have much time to blog over the weekend, I'm only a day behind as far as the 31 Day Challenge goes. I'll try to make that day up... somewhere. 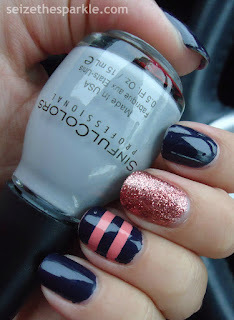 But for now... my STRIPED nails! Before the 31 Day Challenge began, I ordered a sheet of KBShimmer nail vinyls. Specifically, this sheet of nail vinyls. It's a mix of thick and thin lines. I believe that the thin lines are the same size as regular striping tape. I used the thick line vinyls for this manicure. When I started out, I knew I wanted to use Butter London Rosie Lee for a glitter accent nail. I could've easily paired it with gray, but I wanted to switch up my nails and go darker than I had for my Polka Dot mani. So I chose navy blue in the form of Road House Blues from OPI. 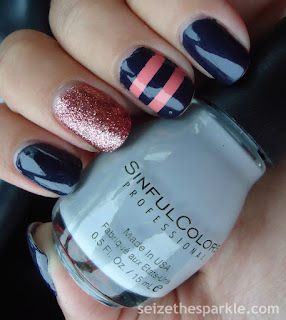 For my soon-to-be striped nail, I chose the closet pink to Rosie Lee in my stash... SinfulColors Soul Mate. Since nail vinyls require a little bit of dry time, I began painting Soul Mate on my ring fingers. Then, I painted a coat of Rosie Lee on my middle fingers. I worked back and forth between the two until they both had Seche Vite on top. While those nails dried, I painted Road House Blue on my remaining nails. Three coats on each nail, followed with a coat of SinfulColors Clear Coat and Seche Vite. Then it was time for stripes! I used two of the thick line vinyls on each ring finger. Once they were positioned correctly, I painted over them with 2 coats of Road House Blues. I waited about three or four minutes in between coats. Using tweezers, I removed the vinyls immediately after painting the 2nd coat. I let my stripes set for about 10 minutes before applying a thick coat of Seche Vite. I did get a bubble, so I might've gone a little thicker than I needed to. I'll definitely remember that for next time!